LAFM: How many years have you been in coaching? This will be the start of my 9th year. LAFM: What is the name of the first school you coached at? I have been at Belle Chasse my whole career. I started off in the secondary, moved to assistant head coach, then offensive coordinator, and now this will be my 3rd season as head coach. LAFM: What made you get into coaching? Who or what influenced you the most? I have always enjoyed the sport and been fortunate enough to play it. I enjoy being around, teaching, and helping these kids. I went to Mobile Christian for High School and my Defensive Coordinator was Tim Massengale. He was a great coach which I realized once I got out of high school. In college, my coaching was not so great, and I realized how good Tim was of a coach. I realized how much Tim actually cared for us kids and how much more detail and effort he put into coaching us. Bob Becnel as well was a major influence. He was a great head coach here for years. Coach Becnel gave me the opportunity to coach. Given an opportunity I try to make the most out of it. Taking the job here at Belle Chasse has been the best decision I have made for my life. LAFM: Did you go to college? What did you major in? I played Wide Receiver at Mississippi College, and I majored in business. LAFM: Who are some of the best players you’ve ever coached? I just had Terren Encalade who is an All-State WR. I think he finished with 27 or 28 touchdowns. He would definitely be at the top. Also Jeremy Vujnovich who played here and went to Louisiana College. He is playing with the Packers now. He was an All-State Performer. Then of course their was Blake Matherne and James Wright. Blake was Mr. Football his senior year in 2008. James went to LSU and finished up this year. Those 4 are probably the top tier. I will say Terren is the most unique out of all of them though. 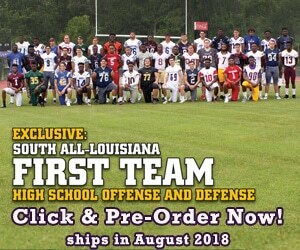 LAFM: What would you like to see changed in Louisiana High School football? I don’t know if their is one thing that I could see changed or done different. I know I can appreciate the talent level, especially in the New Orleans area. LAFM: Do you think the brand of Louisiana football is different than anywhere else? Louisiana Football is fantastic. I have the privilege of having a step brother who plays for Spanish Fort in Alabama who won the 5A state championship (2 years running actually). I can tell you they would not go undefeated in our 4A district here. Honestly, I do not see them going farther than 2nd-3rd round of the playoffs for Louisiana 4A. I watched them play in the semi-finals their and it was a noticeable difference. Their is so much talent here. I mean you have your big name guys and premier players. I think we had 6 of the top 50 national recruits. It is not just those top guys but the next tier like a Terren Encalade or Robert Kennedy. That tier may not get as much attention but are still premier athletes and top of the line players. Their are so many kids like Niguel Veal of West Jeff who are just another guy here but in another places would be the best player in the city. You notice the trend now where Vanderbilt is coming down, Arizona, Arizona State is coming here as well. They are taking that 2nd tier player because they realize they are going to be great college football players. LAFM: Do you feel like the offense/defensive philosophies differ between North and South Louisiana? I know that down south you get a lot more of a spread look and a lot more man coverage on defense where it is more pressure first and cover with great athletes. As far as the North, their brand is really good too. It is not a matter of north vs south. I like to look at it as Louisiana as a whole and take it for what it is worth. I know that their were 6 schools ranked in the top 50 in the country at one point. That is amazing. It is just good football from top to bottom. LAFM: Who is your favorite NFL or college player of all time and why? As a WR in college I admired Jerry Rice and everything he did. That was a person I tried to learn from. I never had a favorite player growing up. As far as learning, I was fortunate to see some cut-ups of Jerry Rice when he was with the 49ers doing one on ones. You can pick up so much from a guy like that. I mean he literally did everything perfect. That is how I try to do everything; perfect. I know that is unattainable, but that is what cause him to play for so long and with so much passion. LAFM: Who is your favorite college or pro football coach and why? I have never really thought about it. I admired Gene Stallings and everything he did. Their is a few reasons for that. Gene Stallings won a national championship when I was growing up, and he had a lot of the same at-home issues that I did. You know his son had down syndrome and died at a early age. My uncle, at the time, was in the same situation. I always admired how Stallings always took care of his son. He went through all of the practices with him and brought him along all the time. I actually was able to meet Gene Stallings on a couple of occasions. He was a very nice guy who took the time to actually talk with me which is a very rare thing. If I had to say a favorite coach it would probably be him. LAFM: What makes Belle Chasse High School a great school?